Callen Radcliffe Tjader, Jr. a.k.a. Cal Tjader (July 16, 1925–May 5, 1982) was a Latin jazz musician, though he also explored various other jazz idioms. Unlike other American jazz musicians who experimented with the music from Cuba, the Caribbean, and Latin America, he never abandoned it, performing it until his death. Tjader primarily played the vibraphone. He was also accomplished on the drums, bongos, congas, timpani, and the piano. He worked with numerous musicians from several cultures. He is often linked to the development of Latin Rock and Acid Jazz. 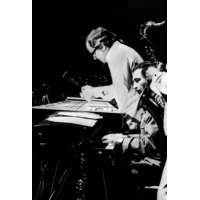 Although fusing jazz with Latin music is often categorized as "Latin Jazz" (or, earlier, "Afro-Cuban Jazz"), Tjader's output swung freely between both styles. He won a Grammy in 1980 for his album La Onda Va Bien, capping off a career that spanned over forty years.